From 10 November 2018 to 28 February 2019 (nights from 29 to 31 December excluded) Hotel Loggiato dei Serviti offers to all those who book a room on our official website with the non refundable rate, the exclusive Winter Experience in Florence! For all reservations on our official website with the non refundable rate we reserve a 15% discount on the entire stay and our abundant breakfast will be included in the price of the room. In addition, if you print this page and give it to our reception upon check in, you will receive our Gift Card for a welcome drink for two people at your favorite day and time, choosing between a glass of wine or a soft drink. 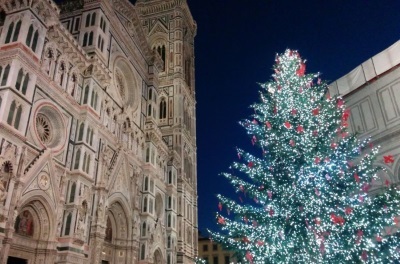 We would like to remind you some of the main events for this winter in Florence: the traditional pre-Christmas events such as the Santa Croce Christmas Markets throughout the month of December, the ancient 'Fierucola dell'Immacolata' which takes place right in our Piazza Santissima Annunziata and the lighting of the big Christmas tree in the Cathedral Square on December the 8th. In addition, the major contemporary art exhibitions, Marina Abramovic at Palazzo Strozzi until 6 January 2019, Banksi at Palazzo Medici Riccardi until 24 February 2019. Finally, we are glad to remind you that from November 1, 2018 to February 28, 2019 you can enjoy the low season rates, with significant discounts for admission to the Uffizi and Palazzo Pitti! Enjoy your Winter Experience in Florence, Hotel Loggiato dei Serviti is warmly waiting for you!